Buying Grass Fed Beef in California, Nevada or Arizona? Shop online for home delivery of organic grass fed beef and more in California, Nevada, Arizona and beyond! Topline Foods ships nationwide and our rates in California, Nevada and Arizona are especially affordable and most deliveries are only 1 day in transit! You can shop online for any of our naturally raised meats including organic grass fed beef, antibiotic free and organic chicken, wild caught seafood, pastured pork and more! Save time and money by shopping online. No more driving around town looking for the high quality naturally raised meats you want only to be disappointed by the selection and quality available. 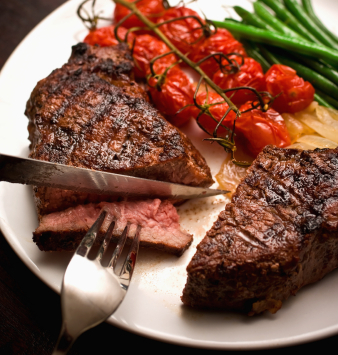 How can you save money and get the best prices on grass fed beef and all our meats? Topline Foods offers a number of way to save money and get the best price on grass fed organic beef and more. 1. We offer discounts for buying in bulk. Just click on an item while shopping online to see if that item qualifies for a bulk discount price and what the quantity is (usually 6 – 10) to qualify for the lower price. 2. Our Loyalty Rewards program will qualify you for a 10% off coupon code after you place 5 orders of at least $99. It is free and automatic – you don’t even have to sign up! We’ll track you orders and send you the coupon code about a week after you place your 5th qualifying order. 3. Refer your friends and family and we’ll send you a Referral Reward coupon for $10 off your next order. Just make sure they place your name in the “special instructions” box at check out so we know who to reward. We also have a coupon for your friends to use on their first order (click here to get the coupon and learn more about our rewards programs). This entry was written by Jeff, posted on July 31, 2013 at 5:08 pm, filed under Announcements - Cities and tagged Arizona, beef, best price, California, grass fed, meat, Nevada, organic. Bookmark the permalink. Follow any comments here with the RSS feed for this post. Both comments and trackbacks are currently closed.